“Over the last few years there seems to have been a newly rekindled interest in the bygone yesteryear ways of old…in particular countryside skills. Inspiring TV moments have gently encouraged our consciousness. I refer to the BBC’s ‘Victorian Farm, Master Crafts Series’ and recently the ‘Edwardian Farm’. I for one find myself with the dilemma of wanting to put my two feet in two different ‘time’ doorways…’the village carpenter’ of yesteryear and now, my life as a sort of 21st Century version of this craftsman. 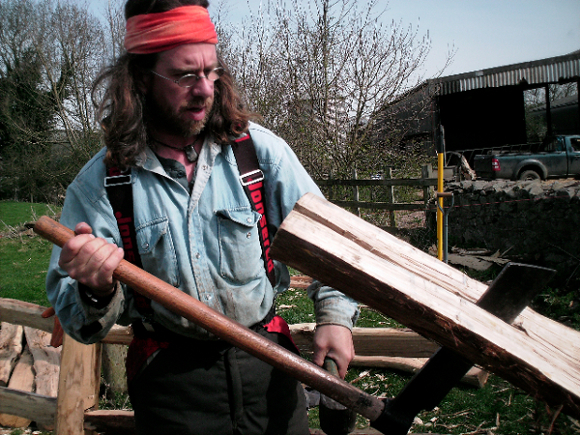 I describe myself as a modern day green wood worker and rustic carpenter, my hope is that I manage to mix and match the traditional skills and old ways with the pressured ‘must make a living’, driven with passion and the ever evolving marketing and promotional strategies of trying to keep a new business afloat in these testing economic times. It’s not ‘old’ verses ‘new’ but hopefully a merger of the best of both worlds and ways. I get no greater pleasure than picking up an old carpentry tool and beginning that age old long process of learning my craft and a new technique ‘hands on and on and on and on… ‘that knowledge found now in aging minds and hands that began as a young apprentice. Those skills soon to be lost, well not if I have anything to do with it! The skills with handling the tool and material were learnt the hard way – the master and his apprentice, a way of life over the generations. Perhaps not everything that is only a click of a button away is always for the best? So, like I say, my feet are firmly placed in these two doorways. Rustic Carpentry and Green Wood Working was born out of wanting to let go of a pressured working life and embrace a new more skills based traditional crafts approach to making a living ‘locally’. Over the last 10 years I have set about, metaphorically speaking, planting little acorn seeds all over the Charnwood area. Being part of the National Forest has also played its part with encouraging the use of locally sourced timber from sustainably managed woodlands in the area. This is something that I feel is critical to having a truly ethical ‘green’ wood business. To emphasise the importance of only working with timber from our local woodlands, this is how I approach my work and my passion for working wood; whether it be coppicing hazel at Beacon Hill, taking part in local country fare, teaching a forestry school session to youngsters about the delights of green wood working, building bespoke rustic oak garden furniture and structures, cleft gates and riven fencing. This is the life of a 21st Century village carpenter. I work wood in all ways, using traditional skills of a bygone day. The National Forest is one of Britain’s boldest environmental projects, creating a new Forest for the nation across 200 square miles of Leicestershire, Staffordshire and Derbyshire. More than 7.8 million trees have now been planted, trebling the woodland cover and transforming the landscape. This woodland will eventually cover around a third of the Forest area to link the ancient forests of Charnwood and Needwood.